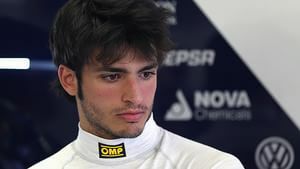 After racing through Formula BMW, Formula Renault and GP3, Carlos Sainz impressed the Red Bull bosses to grant him a test driver during young driver events at Silverstone. He was signed for his debut Formula One season in 2015, partnering Max Verstappen at Toro Rosso for a double rookie lineup. He remained at the team for 2016 and 2017. Carlos Sainz started his motorsport career in karting, following the traditional route towards single seaters and eventually Formula One. He had several victories in karting which gained him attention, and he moved up to Formula BMW in 2010. He was initially a guest driver, but his results impressed enough to get a full time drive. He drove in some seasonal Formula Renault series, and then moved up to Formula Three during the 2012 season. He picked up pole positions and podiums but didn't quite manage a win. In 2013, he switched to GP3, signed to the Arden team, combining the season with a stint in Formula Renault 3.5. With Red Bull connections, Sainz was granted a test in both the Toro Rosso car and the Red Bull, during Young Driver testing at Silverstone. He was signed for a full time Toro Rosso drive, making his F1 debut in 2015, replacing the outgoing Daniil Kvyat. It was a tense battle between Sainz and teammate Max Verstappen, and although Max finished ahead in the championship, Carlos still managed to impress and remained with the squad for 2016. He was disappointed when Max Verstappen was given the call up to Red Bull when the team decided to swap with Daniil Kvyat, but Sainz used the emotions to spur him on to continue performing, and he earned himself another season with Toro Rosso in 2017. Learn more about Carlos Sainz Jr with the Pocket F1 Handbook. There were red flags galore in the final afternoon of running. Nico Hülkenberg's Force India ended up on the back of a truck after smoke poured from the rear of the car and ended their running early. Carlos Sainz Jr spun off track, and headed to the medical centre for an all-clear check. The team blamed the off on high winds.Valtteri Bottas also caused a red flag, as did Felipe Nasr in the Sauber in the final ten minutes of the day. Notable issues include Ferrari's delayed start to the day, due to a telemetry issue, Carlos Sainz Jr who caused one red flag and Marcus Ericsson who caused another - just one hour into testing, although he didn't need the car to be recovered and made it back to the pit lane. Carlos Sainz Jr will be the first to drive the newly launched Toro Rosso, making his official debut as an F1 driver. Yesterday, he tweeted: "Finally got to Jerez! Tomorrow some sport, track walk and STR10 presentation. Sunday will be the first day in my new "job"!"